You act on impulse. Research shows that impulse purchases actually create a pleasant rush. Think before you buy. Woroch said creating a budget and tracking your spending can help. You give into emotions. It’s tempting to reward yourself after a long work week. But there are less expensive, “alternative way[s] to control your emotions” like exercising or venting to a friend, she said. You spend before you save. Retirement experts urge workers to “pay yourself first,” which means allowing an employer to make a payroll deduction to your retirement account – and making do with what remains of your paycheck. Not signing up for a 401(k) that provides a matching employer contribution senselessly leaves “free money” on the table. You don’t have any cash for emergencies. Barely making it from paycheck to paycheck only spells trouble, which will compound into the future. 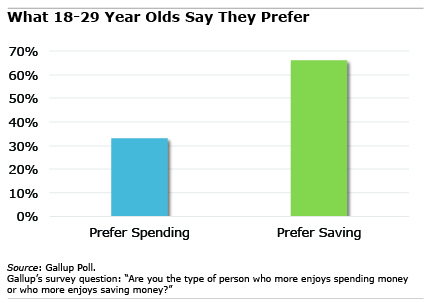 Yes, it’s difficult to save for the retirement and, at the same time, pay off student loans. But saving money for emergencies is essential. The bottom line is that lots of Millennials need to start putting away between 7 percent and 10 percent for retirement and set aside funds for emergencies, or risk serious consequences down the road. They simply don’t have as much to spend as they think they do. The focus on Millennials implies that these are habits to which the rest of us are not subject. That, of course, is nonsense. Millennials are powerful. The applicable rules are valid. I think the gist of the comments is that this article looks and smells like clickbait for Andrea Woroch. I am a millennial and the opening line resonates with me. I wasn’t earning as much as I thought and was spending more monthly than I earned. Once my wife and I got on a budget about 2 years ago, we began spending less and less each month and now spend well below our means. It sounds so simple but so many people refuse to take the time to get on a written budget. We now have an emergency fund of 5 months expenses and manage to save roughly 20% of our income for retirement (and both those numbers continue to climb).